“When I see an adult on a bicycle, I do not despair for the future of the human race,” wrote H.G. Wells. The author of sci-fi novels might have cast an optimistic eye on Tacoma, which boasts a lively bike culture as well as one of the country’s oldest bicycle clubs, the Tacoma Wheelmen (est. 1888). During National Bike Month, in May, regional artists keen to the possibilities of two-wheeled transport rolled out their ideas for the 4th Annual Zeit-Bike Competition, organized by the Tacoma Art Museum and the City of Tacoma. Zeit-Bike 2010: Movable Feats attracted a full field of human-powered designs vying for three $1,000 prizes awarded by the City of Tacoma; the winning bikes, by Eric Holdener, Bil Fleming and Scott McGee, are arriving this week at the Woolworth Building, at 11th & Commerce. Unique artistry and eco-friendly functionality come together in these kinetic bike sculptures, which can actually be ridden. 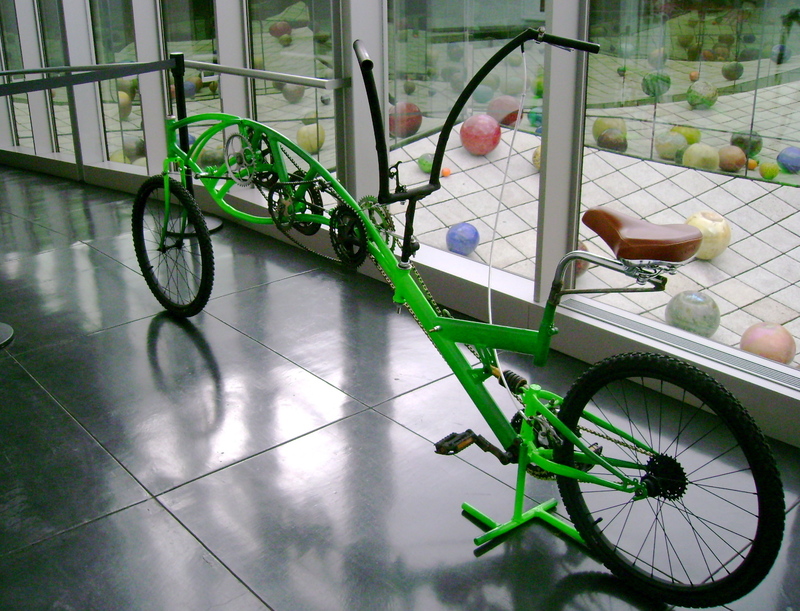 Eric Holdener is an Olympia sculptor and a two-time winner of Zeit-Bike. His entry, Flightless, resembles an old-time flying machine, and is a tribute to the era of engineering that preceded the Wright brothers. 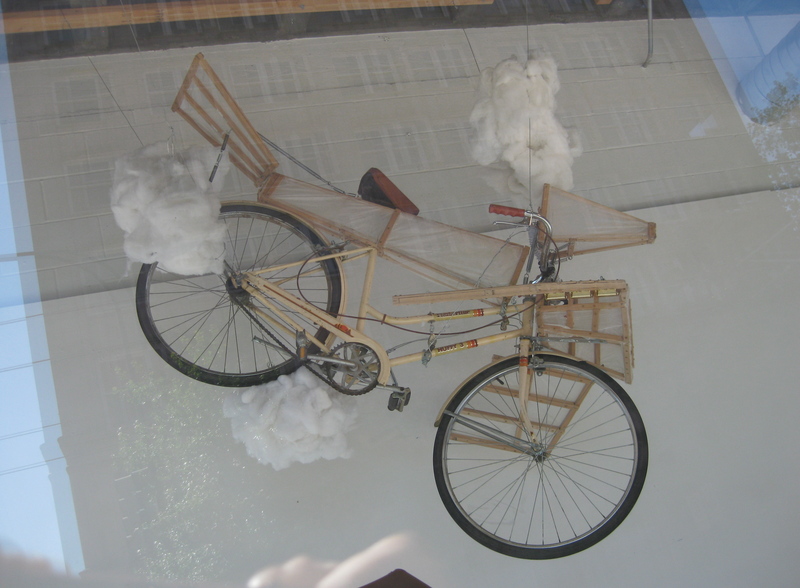 Holdener took a vintage bike the color of balsa wood and fitted it with a clean, wooden frame attached to white cloth-covered wings; the effect echoes “the look and feel of materials they might have used,” he says. The Wrights (who, incidentally, owned a successful bike shop) lived during an evolutionary period of “optimism, genius, as well as miscalculation. That period broadened our view of what is possible.” Holdener’s 2007 winning design, Harmony, will also be on display at Woolworth’s. 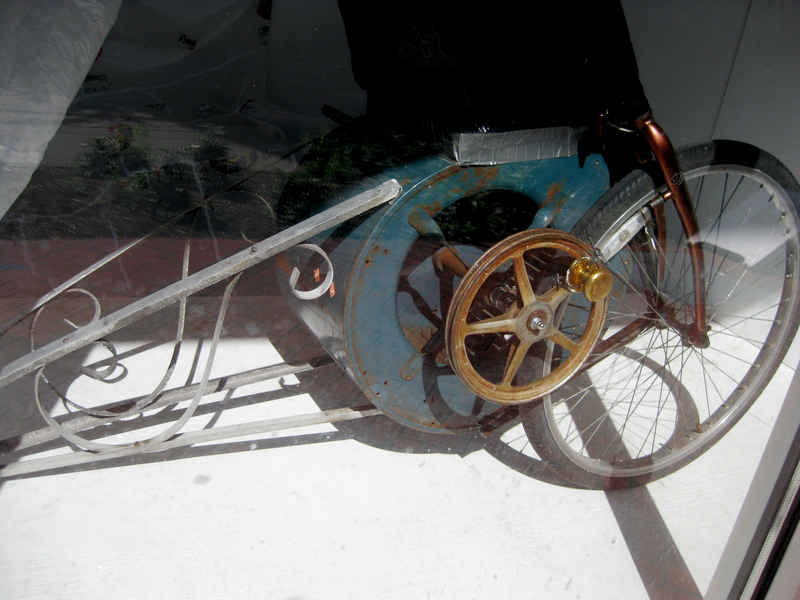 Bil Fleming’s kinetic assemblage, Traffic Terror Tow-tem, “portray(s) the fears we all have of riding a bike for transportation,” according to the artist. This fantastical bicycle, made from re-purposed junkyard materials, pulls a trailer mounted with a squirrel cage fan that inflates a waving, plastic windsock-type creature which appears to chase the bike rider from behind. The fan is powered by the bike’s rolling wheels.